Wonderful readers - I have been out of commission since Wednesday and am behind on replying to your comments and reading other blogs. When you read this, you will understand why, but I sincerely apologize. This is a picture of Smiles. She is, of all things, a Rhodesian Ridgeback mix (my Nonni is a purebred RR). Smiles was abandoned in a field near my apartment and it took me 5! weeks to gain her trust. This past Wednesday she finally let me pick her up and take her to a friend’s house. I call her Smiles because once she warmed up to us, she loved playing with my dogs (and my friends’ dogs and kids) and being loved on. When she’s happy she smiles and shows her teeth. Too cute! My friend from the dog park was willing to foster this puppy for 10 days (before having to leave for vacation). She thought it would be a good idea to introduce her to the regular morning group at the park so they could help find a forever home. Unfortunately, there was a guy there who "tried to help" a bit too much, and Smiles panicked and got off leash outside the fence. Several people at the park were willing to verify this. Good news is, somehow the Arlington shelter got her. Bad news is they have her down as owner abandoned because they say she was “inside” the fence at the park. I wasn't there the day she got loose from my friend so I don't know exactly what happened, but what I do know is that they euthanize those dogs within 72 hours!!!! I found out about all this on Friday and went in yesterday morning right when they opened to give them the actual history. It was a horrible experience. They wouldn’t believe me. They kept trying to accuse me of being the owner. I tried to get them to look at a series of pics on my phone that shows where I was able to get closer and closer to her in the field over time. The pics are even time/date stamped. They wouldn’t even look at them. They acted like I was a criminal. One of the clerks even mentioned ticketing me because the dog is so severely malnourished. I told them that of course she is malnourished, it took me 5 weeks before she’d let me help her! I told them I would take food to the field but I never knew whether or not she was the one eating it. The clerk actually rolled her eyes!! I left, but after I thought about it for awhile, I realized that since it went so badly at the front desk maybe I should have talked to a manager. So I went back and tried to talk to the manager but HE even asked me if I wanted to do an owner reclaim! He also said I was contradicting my story. I was not! And once again, he wouldn’t look at the pictures nor was he willing to talk to anyone from the park that was there when the dog got away. I gave up. As I left, I called my friend and she said I must have just missed the "helpful" guy from the park, who also volunteers at the shelter. She said he was going to talk to them on behalf of the dog. I was so excited! I thought, Great! Now maybe they will understand and believe me. So I walked back in and even HE asked me if I was the owner! I exclaimed once again, “I am not the owner. I am the person who worked 5 weeks to rescue her!” At that point the manager said I had been in there 3 times already and it was time for me to leave. I was humiliated and mortified. I can see from the manager's point of view that 3 visits was overkill, but each visit was for a different reason. I was irritated and bewildered, and I’m sure it showed, but I was NOT inappropriate. I have never been asked to leave anywhere in my entire life! On top of feeling hopeless for that poor dog, I can’t even describe how bad I felt. I cried off and on all day yesterday. And cried again tonight relaying the story to my sister. It's not just about poor Smiles. And I don't want to make this about me, but I am devastated. This is just one more blow that shows how much my life has changed. I can't seem to get it on track. 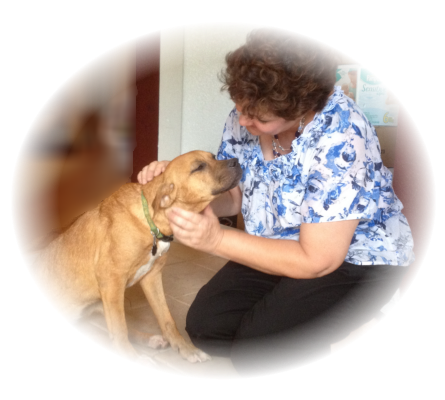 In Austin, I was welcome at shelters, worked with rescue groups and we attended monthly Ridgeback playdays as often as possible. Here? I not only DON'T get a thank you for my efforts - I get kicked out of the shelter! I can't figure things out anymore. This incident rattled me to the core. My friend and I both love animals. Maybe that's why we met at a dog park, LOL. In fact, we both have 3 animals. One of hers is even adopted from this same shelter! Both of my dogs are rescue dogs. They have been with me for years. Bentley is 10 and Nonni is 7. Between them they now know 19 commands and hand signals. I am not certified nor a professional, but I train dogs for family and friends. I would never abandon or abuse an animal!!! The ironic thing is that Wednesday during the day, my friend had rescued another dog that was a stray in her neighborhood. 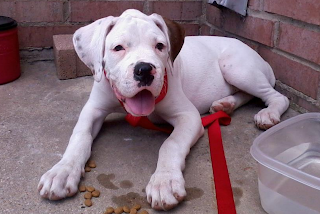 This one is a Boxer pup. 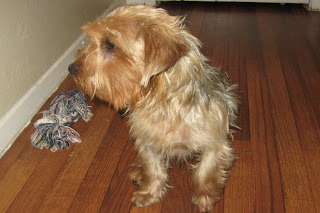 Also, unbelievably, when I came home Thursday evening - a stray (Yorkie?) that has been running around the apartments for a couple of weeks (and no one would claim) - was just sitting on my doormat. Just sitting there! It was matted, filthy and was getting sores. 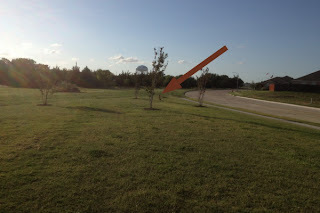 I took it to the Grand Prairie shelter. It hasn't shown up on their pages yet. I'd like to hear from you wonderful readers.... have you ever experienced anything like this with shelters? What do you do when strays come into your world? NOTE: All 3 dogs were checked for chips. No collars. No chips. There was a German Shepard mix hanging around the area last week. He loved Nonni & Bentley and followed us back to the apartments several times. He would hang around for awhile and loved playing with all the kids. Then people were mean to him and I never saw him again. I didn't do anything to help him and it made me feel really, really bad. I told myself (and God) that if another stray came around I would try to help it. I guess I had better watch what I say and pray!!! I am sure you stayed true to the promise to yourself and God. You did try to help it. This just didn't work out as we had hoped. I am terribly sorry any of us had to experience this, I know a HUGE reason lies on my shoulders. You, however, followed through on your promise. It's just a shame that liars, cheaters, and back stabbing people interfered with the follow-up. I know how very hard it is to NOT beat yourself up, but you HAVE to search for something good in this situation. That baby is no longer alone in the scary world. ---BEFORE I SAY ANYTHING MORE!!! I have to call you....OMG!!!!! @ Brianna - You had no way of knowing the dog would get loose. It is a shame that guy pulled so hard on the leash and insisted on walking the dog in like that tho. Again, not your fault. And I understand why he did what he did, and I really think he thought it was best to lie to the shelter. But he was wrong. Fabricating or embellishing is never a good thing - no matter the intent. You and I are good - and I still have my fingers crossed for Smiles. No worries! @ Trina - I appreciate your comment but disagree that city run shelters are a waste of time or that they only care about money. That has not been my experience in the past. I think shelter staff was acting on some bad information given them by a well-meaning, albeit misguided, young man. The no-kill shelters stay full. If they get an opening, they usually go to the city shelters to take ones that are on the short list. They help save a lot of lives that way and I know the city shelters appreciate it. Yes, people can be hard-hearted, but I think most mean well. Trying to help is the important part for your life. The alternative is being cold and heartless. You ARE a good person and your efforts will be rewarded. Remember all of the people and animals you have helped. Don't give up your hope for life to be good. Keep caring and you will continue to make a difference. @ John - thank you for your kind words. You know me better than most so it really means a lot. Thank you. @ Sandra - exactly! Why would I lie? Yes, they were very unkind and I don't think that was fair or necessary, but I'm hoping it was due to them getting some bad information from another source. However, I've heard similar stories from others that have gone to this shelter with strays too. Hopefully a lesson can be learned from this and they will change how they treat people that are trying to help. All that matters to me now is that Smiles stays alive and finds a forever home. I'm still hoping, and praying. HugZ! I just don't get it. I'm sure that the shelter gets all kinds of people in there but still it sounds pretty unreasonable on their part to have treated you that way. It doesn't make sense to me that a person who originally had abandoned a dog would go back to reclaim it. I see no reason for them to have not believed you. At least you know that you did your best for Smiles and that's all you can do. @ Ann - I didn't get it at first either. I really think I was in a state of shock for awhile. Then I found out that the person who took her inside the fence was actually the one who reported her as owner abandoned. What is really ironic is that he is the one who was also holding her leash when she got away. My friend, her husband and this guy tried to recapture Smiles for several hours. My friends had to leave and it was after that he was able to take her inside the park & then make the false report. I think he meant well, but wow, he made some very bad decisions and caused a lot of hardship for a lot of people. I wish the shelter staff would have at least looked at my pictures. Then maybe they could have put 2&2 together as well. No matter, they shouldn't treat people like that. It was bizarre. I felt like I was in a Twilight Zone episode. I have peace today that I have done all I can do. Still hoping and praying for that sweet dog tho. Keep your fingers crossed for Smiles and thanks for the support!